Sometimes it is the simplest things we do in life that matter most. We tend to over-complicate things as parents, don’t we? We stress ourselves out with too many extra things when the basics are what will take us the furthest with our kids– the hugs, the I love you’s, expressing gratitude for their help, cheering on their efforts to improve, and most of all– listening to them. We over-complicate our lives trying to give our kids every opportunity to develop their talents and achieve greatness, which is a good desire, but too often this comes at a price. Time together as a family falls by the wayside as we run from practice, to game, to rehearsal, to performance, grabbing dinner to go, then returning home exhausted, only to be greeted by a pile of homework still lurking in their backpack waiting to be dealt with before we can collapse in our beds. Ugh. Can you relate? I need to take a nap just thinking about it! Why do we do this to ourselves? It is time to simplify people! To get back to the basics that often get overlooked, but in reality will have the greatest impact on our children’s lives. 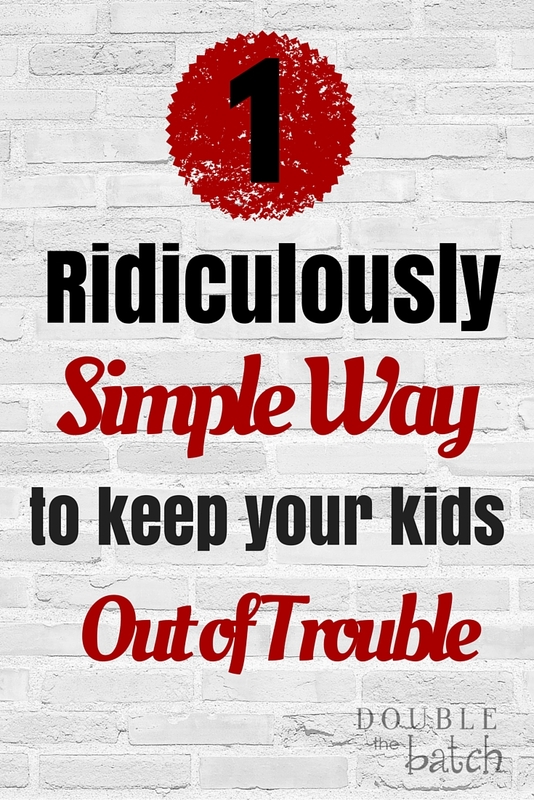 Do you want to know the one simple thing you can do every day that will help keep your kids out of trouble? Wait for it, wait for it… Family dinner time. No joke. Making this one little thing a priority will have a HUGE impact on your kids- it will literally shape who they are and help you create lasting bonds that will make them more likely to care about what you think than what their peers think in the long run. In fact, studies show kids who eat dinner with their families on a regular basis are less likely to be involved in gangs, drugs, violence, eating disorders, to be depressed, or to be promiscuous. They are more likely to get good grades, bounce back quickly from bullying, and have a more positive view of the future. Seriously? That is a pretty remarkable return on investment right there. One hour of your day for those kinds of results? It’s a no-brainer. Family dinner time should be one of our highest priorities. Because I feel so strongly about this, I am thrilled to let you know about Vanity Fair® Napkins campaign to #takebackthetable! Vanity Fair® Napkins is challenging families everywhere to #takebackthetable and make family dinner time a priority again. We took the challenge and it has been fantastic! Now that I recognize the value of family dinner time, I’ve started trying to squeeze as much as I can out of that precious hour with my kids. Dinner time is a great time to sit and really listen to your kids without being distracted by all the projects you are trying to accomplish throughout the day. We turn off the screens in our house and enjoy each other’s faces and personalities. We have great discussions and we laugh together. That famiy looks so happy, right? But, let me level with you. We don’t actually look like this family every night at dinner- and that’s ok. Some nights it doesn’t work out as I hoped. Sometimes my kids fight at the table. Sometimes I’m tired and frustrated and they hate what I made for dinner which makes me more tired and frustrated. I make yummy food, dang it! What is wrong with my children’s taste buds? Sometimes we are rushing to get somewhere. Sometimes my husband comes home late. But, as with everything in parenting, putting forth a consistent effort over time is more important than perfection today. If you just keep trying, you’ll get it right more often than you get it wrong! And we are looking for a long-term affect here, not a short-term fix. Don’t get discouraged! Just. Never. Give. Up. Those moments you spend around the dinner table connecting as a family will fill your kids with the love, belonging, and acceptance they need to feel at home with their family, so they don’t go looking for it elsewhere. So, I challenge you to #takebackthetable! Make dinner time a priority at your house. You don’t need to make extravagant meals. Keep it simple. Use that CrockPot! Heat up leftovers or just pour bowls of cereal all around if you have to. It is the time you are spending together that matters most. Talk to your kids about why it is so important. Get them on board with making it a priority every night. Turn off the screens and connect as a family. Challenge your friends and family to do the same! I have, and they are seeing a great affect on their families as well. I promise- you will never regret it. You can connect with Vanity Fair® Napkins on all social channels (Twitter-@VanityFairNapkins, Facebook-Vanity Fair Napkins, Pinterest- PinVanityFair, and Instagram- vanityfairnapkins) to follow this awesome movement to #takebackthetable!